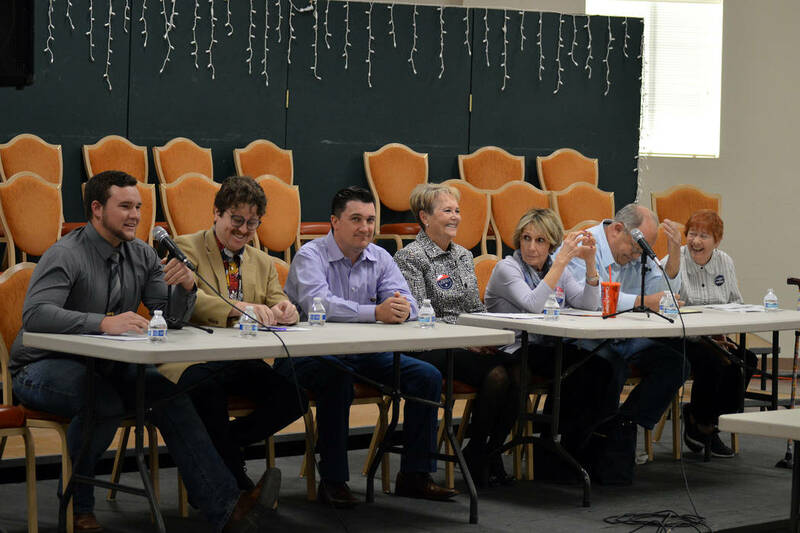 (Celia Shortt Goodyear/Boulder City Review) City Council candidates, from left, Trenton Motley, James Adams, Rich Shuman, Peggy Leavitt, Claudia Bridges, Tom Tyler and Judy Dechaine, participate in a forum March 13, at the Elaine K. Smith Building. (Celia Shortt Goodyear/Boulder City Review) Residents attend a City Council candidate forum March 13 at the Elaine K. Smith Building. On March 13, incumbent council members Rich Shuman and Peggy Leavitt along with challengers James Howard Adams, Claudia Bridges, Judy Dechaine, Trenton Motley and Tom Tyler answered questions submitted by the public during the forum at the Elaine K. Smith Building. Brent Foutz, who has filed to run for council, did not attend the forum, which was hosted by the Boulder City Review. 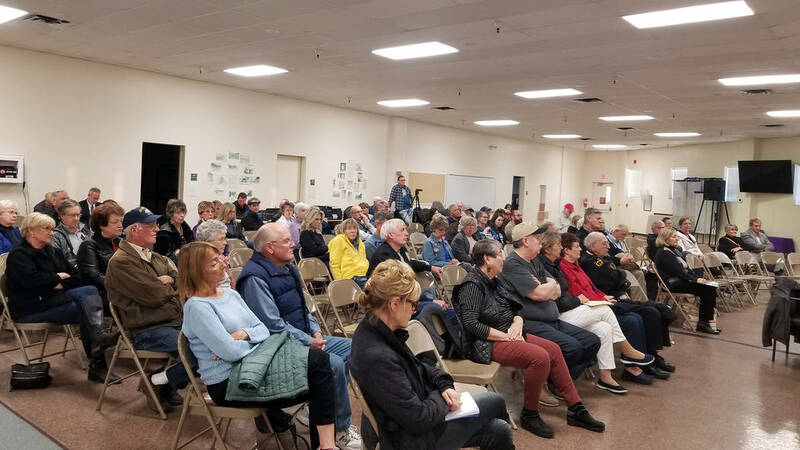 The questions asked dealt with off-highway vehicles on city streets, historic preservation, political inspiration, city indebtedness and the proposed aquatic center. “I wanted to hear them and see their facial expressions and how things came through,” said Darlene Looney, who also came to hear the opinions of the different candidates. “I came to get a feel for them and put a name with a face. … I hope they stick to what they say,” added Mike Gerlicher. During the discussion, all the candidates agreed about the importance of historic preservation in Boulder City as well as having the public weigh in on the use of off-highway vehicles on city streets through an upcoming advisory question on the June 11 ballot. They did not, however, agree on the necessity of the proposed aquatic center, which the city is seeking approval for up to $40 million in general obligation bonds to finance. She said it should be left as a standalone pool because it’s cheaper and faster to build, and amenities could be added later. “It makes sense to do a little bit at a time,” she added. Bridges also agreed that the pool is necessary but said the $40 million amount is too high. Shuman did agree the city needed a pool, but he said he was concerned about the integrity of Broadbent Park with the proposed project. He said he did not want the new facility to ruin it. Adams said he felt like the project was being set up to fail, that it had been rushed and the ballot question was not specific to just a new aquatic center. “It comes back to do we trust the composition of the council, whatever that may be, with that amount of money?” he said. Motley said a new pool is necessary, but it’s not $40 million necessary. The city should keep the current amenities at the pool and expand the gym in ABC Park, 801 Adams Blvd. Tyler said the city should not keep putting money into the current pool. Rather, the city should close it and put that money into building a new one at the same location. He said the community would just have to bite the bullet for a while and residents could use the pool in Henderson. Leavitt was the only candidate who said she thought the aquatic center as proposed was a necessity. She said it had been talked about for years and was long overdue. She added that the option included in the ballot question took into account what the community had asked for. “The city did what was requested,” she said.